Heidi's skillfully and gently pulled the salon team together in a dynamic role of support for the cause! Their teamwork helped send Heidi to Seattle as they became involved in a variety of events and efforts to raise money and spread the word about breast cancer research. 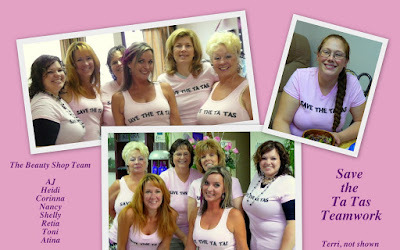 Together they promoted the cause in conversations with their own clients, and teamed up by participating in a car wash for breast cancer research, a pink buffet, and by joining together in wearing pink T-shirts that said "Save the Ta Ta's". Enthusiastically they sent Heidi off to Seattle --- to walk and promote the cause. Click on the photo so you can see it better. What a great thing Heidi is doing to support a much needed cause. The food looks delicious too, all in pink. I can just picture the pink tents tonight and send best wishes to Heidi in her walk.